DESCRIPTION: Of the international airports around London, Gatwick is number two. This lavishly illustrated book charts the history of the airport from the purchase of a flying field in the 1930s by two young men. The quality of the illustrations is good to outstanding and the text is readable and concise, painting the picture of the history of Gatwick from a humble start to a bustling modern airport with good road and rail links for passengers. The author is a lifelong aviation enthusiast and his love of aviation enhances a very workman-like book that provides an excellent review of the airport and the struggles it has worked through. In the 1930s, airports were only just arriving in Britain. There were many airfields but few airports. The air routes to Empire were still served almost exclusively by flying boats and even the larger airfields were still fields with few buildings and little concrete for taxi ways and runways. At that point, the majority of passenger aircraft were still single or twin engine aircraft, biplanes and fabric covered. Their relatively light weight allowed them to operate from grass strips and only a few, such as Croydon, serving London, had anything approaching an airport terminal as we would recognize it today. For long range flight, the flying boat still held the advantage that it did not require clearance of more ground to provide longer runways for heavier aircraft, and it could land and take-off from rivers and lakes across the British Empire. WWII changed all of that. For Gatwick, it meant use of the airfield for fighters, ground attack and reconnaissance aircraft. For airports in general, the war saw the development of progressively heavier aircraft with the introduction of four engine heavy bomber landplanes. This produced an increasing number of airfields with long concrete runways and permanent buildings. Before the end of WWII, VIP air transport saw modified bombers used to transport key personnel and Gatwick was designated as a VIP airfield. At the end of WWII, there was a glut of ex-military aircraft, both large bombers and proven transports like the DC3/C-47. That provided the means of getting civil aviation of to an accelerated start, with ex-military aircraft being modified to provide improved passenger comfort, beginning to drive the flying boats out of business on the long distance routes. 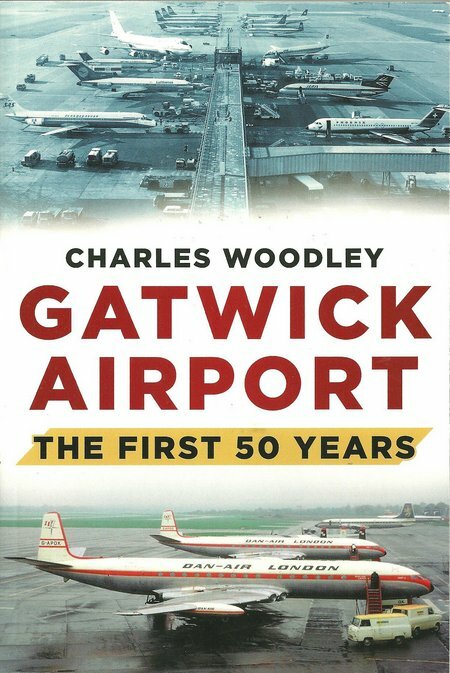 The author has packed a great deal of information into what is an interesting and nostalgic look at the development of Gatwick into one of the most successful airports in the world. Amongst the photographs are some interesting shots of the wide range of aircraft to use Gatwick over the years. What helped Gatwick greatly in its formative years was a mainline rail station and proximity to the Brighton to London main road. These links have been further improved with the Gatwick Express providing a fast link from the heart of London. Gatwick became home to Dan Air, often referred to as Dan Dare after a comic strip, and over the years has seen several airlines come and go. What the author has not done is speculate about the long term future of Gatwick. The lack of Government planning for London’s airports has been a shambles through successive administrations. The result is that Heathrow continues to suffer procrastination over further runway and terminal space. A similar mess affects the future of Stanstead, Southend is emerging as a much larger airport with true international status. Luton continues to grow and Gatwick similarly manages to escape public debate, whilst debate continues over the practicability of building a completely new London airport in the Thames Estuary. The demise of Concorde has taken some pressure off the need for a London Airport away from the most populated airports where noise is less of an issue. Gatwick continues to provide valuable space for scheduled airlines and continues to provide good access to London. Perhaps there is another 50 years or more for the story to run.